Well, it has taken me this long to follow-up here about the remainder of our Florida trip plus some new developments in Drew’s medical future. Now that school is back in session, I finally have some freedom to sit down and piddle away on the internet. The remainder of our trip in Florida went well. Drew didn’t have surgery on Wednesday so that freed up our week to do a few activities in almost a vacation sort of way. We visited a small water park and Drew’s favorite activity, one that he still talks about today, Fun Depot, a Chuck E Cheese without all of the media hype and birthday parties. But we were most excited about meeting a fellow TAR family. The mom and I had previously been in frequent contact with each other on Facebook and text messaging since we were both in the same boat of caring for a child with TAR as well as being a Paley patient, but we had never had the opportunity to actually meet. So, it was fascinating to finally get to be close to one who knows the tribulations so intimately and even more fascinating to see how our two lives were so similar, sharing some of the same experiences and quirks to raising young boys in general. 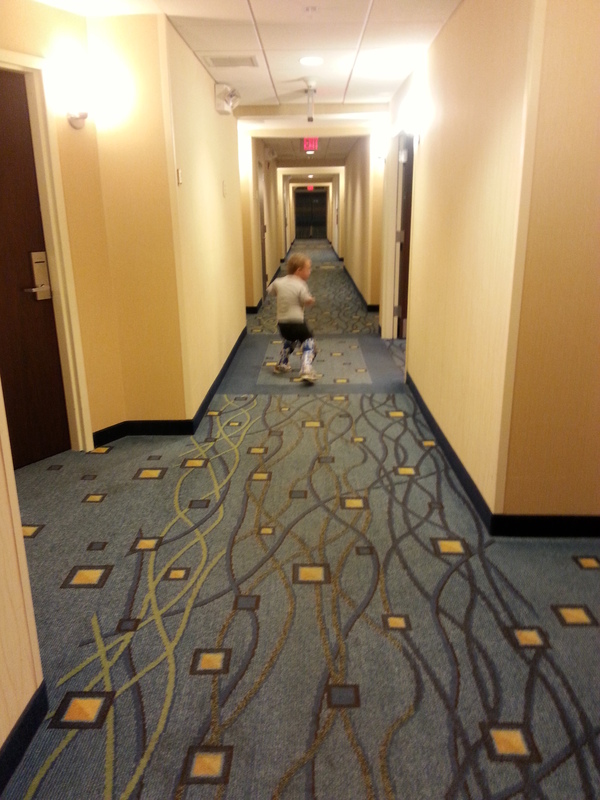 What do you do when you’re seven and walking in a hotel with tacky carpeting? Play “Dodge the squares” of course! One more thing worth mentioning: While we were at the water park, we came to terms quickly how blessed we are to live in a community like ours back in Kentucky who accept Drew. Here at home, Drew’s TAR is a non-issue with kids, but we did not have this same experience at the water park. Now, I understand that Drew is an interesting looking fella. It’s not everyday you see someone with such significantly shortened arms and it’s not that Drew doesn’t capture strangers’ attention even here, but even curious onlookers here who see Drew for the first time understandably observe and then they move on, occasionally asking why he has short arms. I’ve never felt under the microscope here. But Drew was much the attraction, in a negative way, amongst the groups of kids at the park who ogled Drew very prominently and unashamed, often pointing their fingers and even dragging their friends who have yet to discover the spectacle. It was difficult to watch and experience. I was torn between ignoring it or shooing them away. In my experience, new kids ask me about Drew’s arms, which is normal and not insulting in any way, and I kindly explain so I thought maybe I should take the first step and talk to the kids to help appease their curiosity, but Drew was completely unaware of the attention so I hoped that I didn’t have to suddenly make it an issue and embarrassing him. He’s at an age now where he has expressed his dislike of his weight (he is not overweight by any means, but these dang commercials on TV blasting “skinny bodies” and perfect abs really do impact young people’s own self-worth). I certainly don’t want him to think that his arms or legs make him worthless, ugly or weird. Anyway, we made it home safe and sound, and more importantly sanity intact after such stressful trauma with the travel through multiple airports and flights once again. We return in six months. Sigh…. 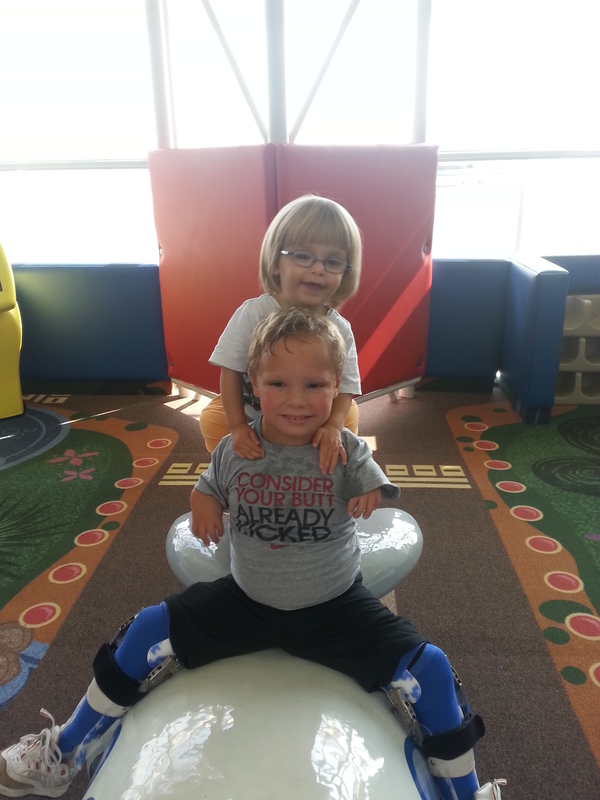 Shortly after our trip to Florida was completed, we were off to Cincinnati to see an upper extremity doctor at Cincinnati Children’s Hospital. We spoke with Dr. Cornwall who I really liked. He was very friendly with Drew and informative. After we met with him, we met with a specialized physical therapist who helped identify what our needs and desires were along with functions Drew currently is able and unable to perform to better shed light on what options would be best for Drew. All in all, the experience was great. S o, now we’re mulling over considering a surgical procedure called a pollicization. This procedure involved removing the thumb and replacing it with the index finger in the thumb position, rotated outward like a thumb. I can’t begin to tell you how bizarre it is to be thinking of amputating a piece of Drew’s body. Even though it’s just a tiny little thumb….a thumb that he never uses and even previously requested himself to remove…but wow, to think about just cutting it off is surreal. Whenever I explain to a new person who asks about what’s ahead, I almost whisper those words and shield my mouth as if I’m saying something offensive not to be heard by just anybody. It just sounds so extreme. Replacing Drew’s hypoplastic (underdeveloped) thumb with his index finger would give him an opposable digit, which he doesn’t currently have. He grasps things between his index and middle fingers and larger things he grabs in his palms, but because his thumb has almost no movement, the object in his hands sits on top of his thumb (his thumb between the object and the palm), it’s harder for Drew to have a strong grasp on the object. It’s what makes it more difficult for him to grab hamburgers and pizza slices to feed himself (we have to hand it to him, but once he has a grip on it he can feed himself) and his inability to use his thumbs has pretty much eliminated any special adaptive devices that people with limb deficiencies use like grabbers, dressing sticks and bathroom sticks. Drew would only have four fingers on one hand (at this point, we are only considering surgery on his right hand), but looking at pictures of a kids’ hands who had the procedure is strikingly normal looking. You’d almost have to look twice to see it’s not a normal hand. It took a lot of discussion and thought to come to a decision to move forward. Drew, who I suspect got spooked hearing of the talk of needles and casts, didn’t offer any input with his uninterested shrug and quiet, “I don’t know.” It is always difficult deciding to put your child through a surgery, but this one is especially complex. This surgery is typically done at 18 months, but apparently we weren’t seeing the right doctors then because this was never mentioned as a possibility. Drew is seven now and he’s gone this long and has mostly overcome the challenge so do we really want to put him through a surgery that wasn’t glaringly needed? I mean, we already have FOUR surgeries planned in the next year…do we REALLY want to add a fifth?!? As difficult as it was to come to a final conclusion, in the end we decided that it will provide significant benefit to Drew and he has enough insurance and Medicaid coverage to perform the surgery at no cost so he might as well do it now, because who knows what expense he may incur as an adult if he were to go through it then. Also, waiting 10-15 more years might make the transition process of losing a thumb and learning use the index finger in its new position more difficult. And, we were introduced to a project in which college engineering students design and print 3D prosthetics for kids with limb deficiencies so I’m excited to see what that project is all about! I’ll share if anything develops in that arena! And, in less exciting news..
You know, Drew has been undergoing physical therapy for over three years now. 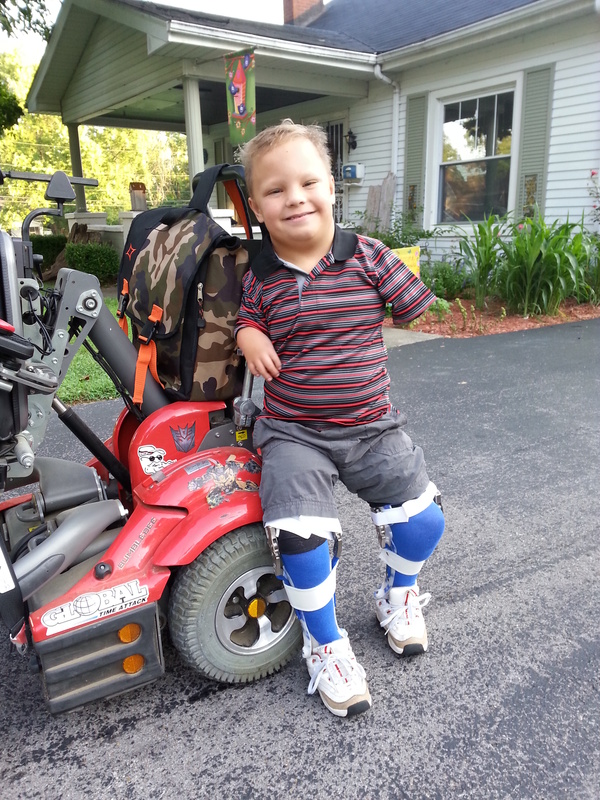 For two to five days a week he has endured hours upon hours of therapy since his very first leg surgery. I wish I could count up the number of session which I’m sure would exceed belief, but I just don’t have the patience to at the very moment, but I do have a collection of appointment cards that I’ve kept for most weeks as momentos that is greater than 3 inches thick when they are all pressed together. Through these years, I’ve seen many patients come and go with a celebratory “graduation” when complete and I dreamed of the day that Drew would get to officially graduate therapy which would be full of celebration because, after all, while others experience a few weeks of therapy, Drew has endured YEARS of continuous therapy and if anybody deserves the recognition and reward, it’s him. But, unfortunately, we have pretty much exceeded our coverage limit and even after seeking and gaining extra sessions, Drew’s progress has slowed and we aren’t seeing great movement in his extension. This isn’t to say that Drew has given up, but according to Dr. Paley during our last visit, he needs additional surgery to enhance the results. Physical therapy is almost becoming obsolete even though we haven’t achieved final results. It was suggested that we decrease therapy from 2x a week to just once and honestly, I just don’t see how once a week can be beneficial. Really, at this point, I feel like a certified physical therapist. I mean, famous people get honorary degrees in fields just for being famous so I feel like I truly deserve a degree in physical therapy. So, it’s not that Drew will discontinue therapy all together, it’s just that I’ll be managing it at home. We always made an effort to perform therapy at home as our sessions decreased, and some of the time we actually DID do therapy at home, but it was nice to “pass the buck” once in a while. It’s a lot of work doing homework, and bath, and dinner, and housework, and bonding time, and chores, and raising a toddler, and this and that so having someone else take over one aspect of life was helpful. But, I can’t let Drew’s progress fall short so that’ll just be one more task to add to my daily list.